San Francisco’s Sunset Boulevard used to host major soap box derby races. As a child living in the Parkside in the 1950s, I remember when my older brother, John, was enamored with building and riding coasters. John's first coaster was a piece of wood nailed to two 2-by-4s (one in front, one in back) with roller skate wheels on the ends. He steered the coaster using rope connected to the front-end 2-by-4. John's next coaster was much fancier. The vehicle looked more like a soap box car, with a place to sit, a big box in front, and a real automobile steering wheel that my father had acquired. It had no brakes; John's coaster days ended when he crashed into and damaged the fence of the Brooks's house at Quintara and Twenty-second Avenue. We didn't know about soap box derby races. We certainly didn't know that the Bay Area (all of California?) semifinals were held on Sunset Boulevard every summer! The soap box derby started in Dayton, Ohio, in 1933. The prevailing story is that newspaperman Myron E. Scott saw some boys racing in homemade cars and convinced local newspaper editors to sponsor a large race. Other people say it was actually George Harrison Condit who started the race. In any case, we do know that the late-summer race in 1933 had a few hundred entries and 45,000 spectators. In 1935, the race was named the All-American Soap Box Derby and moved to Akron, which became its permanent home. The 1935 race had 52 entrants--finalists from races around the country--and approximately 90,000 spectators. In 1937, Life magazine reported that 130,000 spectators watched 120 finalists race in Akron. The rules clearly stated that each car (or "coaster") had to be made by the boy entering the race--not by an adult--and had to meet specific guidelines concerning weight, wheels, mode of construction, materials cost, --no more than $10!--, and more. Chevrolet sponsored the national event from 1935 to 1972, hosting finalists during the days preceding the race in Akron and providing prizes (usually partial or full college scholarships). Local newspapers sponsored the semifinal races in cities around the country. In 1937, the race went international, with races in South Africa, Hawaii (not yet a U.S. state), Mexico, and Canada. At its peak in 1972, entrants came from 250 cities in the United States, as well as from Germany, Canada, and the Philippines. The Soap Box Derby came to the Sunset District in 1946. 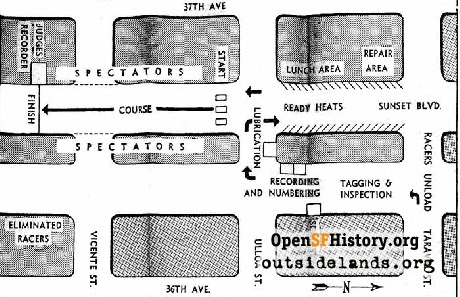 The first San Francisco Derbies, 1936-1938 were held on Carolina Street on the north slope of Potrero Hill, moved to Treasure Island for 1939 and 1940, and returned to Carolina Street in 1941. 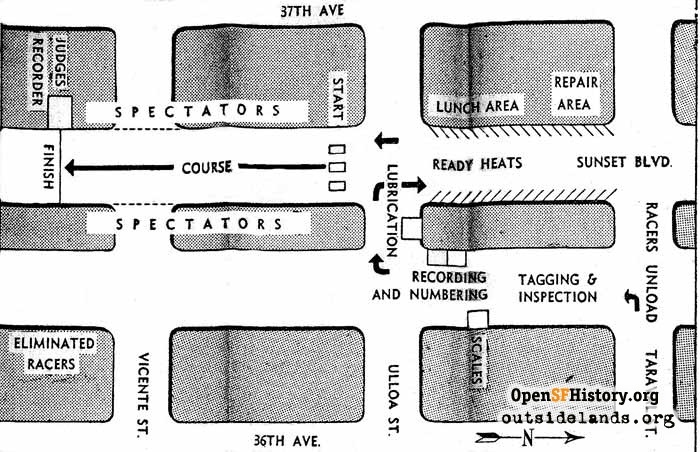 No derbies were staged during World War II 1942-45. Sponsored by the San Francisco Chronicle and Chevrolet, the race was open to boys aged nine to fifteen. The race course was on Sunset Boulevard between Ulloa and Wawona. Sunset was clearly a different kind of road in August 1946; after the first Sunset soap box derby, the San Francisco Chronicle wrote: "Sunset Boulevard, a lovely, peaceful parkway drive in the Sunset district that is seldom used even on Sunday, was turned into a speedway between Ulloa and Wawona yesterday." The San Francisco Soap Box Derby was co-hosted by various local Chevrolet dealers and by the San Francisco Chronicle from 1937 to 1953. The San Francisco News was the local newspaper host from 1954 through 1959, when sponsorship appears to have reverted to the Chronicle. On Sunday, July 30, 1939, 200 boys raced on Treasure Island in conjunction with the Golden Gate International Exposition. As anyone who has been there knows, Treasure Island does not have the hills found in the city. The soap box group built a steep ramp to accommodate the race. 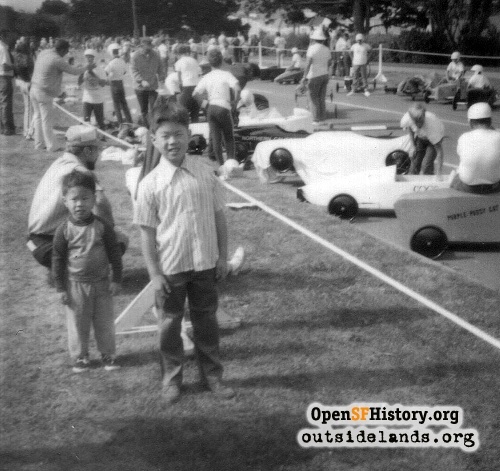 Over the years, the winners of San Francisco's Soap Box Derby came mostly from outside San Francisco. They include Pete Saugman of Berkeley (1940), Clifford Cain of Oakland (1950), Mickey Mynsted of Sacramento (1952), and Tony Christlieb of Los Angeles (1956). After that 1956 race, the rivalry between San Francisco and Los Angeles was apparent in the newspaper headline that read, "Can It Be?--L.A. Boy San Francisco Soap Box Champ." In 1954, Danny Kalijian, a San Franciscan who lived at 1783 Twenty-Eighth Avenue came in second place. Richard Lim's sons at one of the San Francisco Soap Box Derby races in the 1960s., circa 1966 - Courtesy of Richard Lim. Originally, the soap box derby was open only to boys. Girls were not welcome to, but that didn't mean they didn't. In the 1933 race in Ohio, the second-place winner was Alice Johnson. "One report said the crowd gasped when she took off her hat to reveal her long hair. "2 (It isn't clear whether Johnson was allowed to keep her title.) In 1934, two Dayton girls entered the race. This was the last time girls were allowed to race until 1971, when the regulations changed and girls were admitted. In 1975, Karren Stead from Pennsylvania became the first girl to win the All-American Soap Box Derby in Akron. She later appeared on the popular television show To Tell the Truth. Boys continued to outnumber girls in the derby races, but by the early 2000s an equal number of girls were racing derby coasters. This year, fourteen-year-old Veronica Harris ("Crash n'Vern Harris") of Campbell, CA, placed second in the Super Stock Division of the All-American Soap Box Derby in Akron. The All-American Soap Box Derby began to lose its popularity after Chevrolet withdrew as a sponsor after the 1972 race. A cheating scandal in 1973 further reduced the race's popularity. In 1947, the Boy Scouts began holding a Soap Box Derby in San Francisco. In 1950, the American Legion Coaster Derby was held near Lake Merced. Like many childhood pastimes, the Soap Box Derby in San Francisco "morphed" into competitions for adults. There is the Artists' Soap Box Derby (started in 1975), the Illegal Soap Box Derby (which ran/runs on Bernal Heights), and the Red Bull Soapbox Race ("The only race where fast is good, outrageous is even better!"). 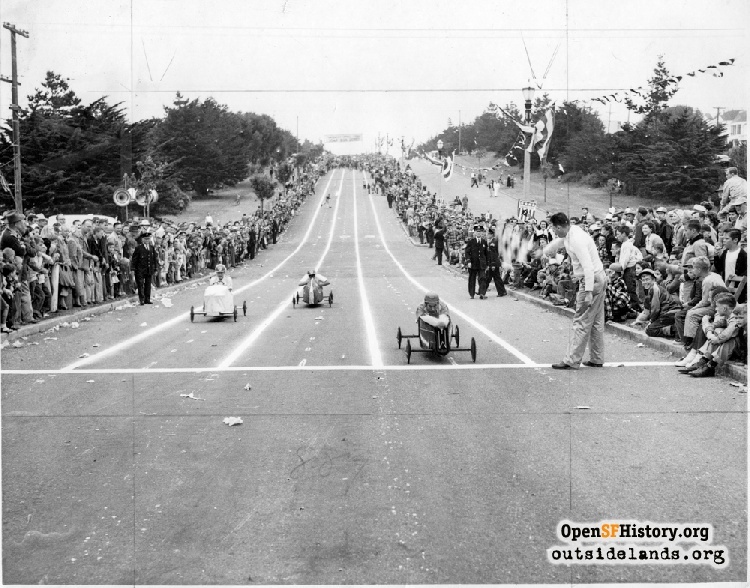 San Francisco stopped hosting the All-American Soap Box Derby semifinals in the 1960s, when they moved to Dublin, CA. In the 1970s the semifinals moved to San Mateo. The races are still run in other places in California, including Vallejo and Tuolumne (the 2011 site). San Francisco Chronicle and San Francisco News, various dates. Payne, Melanie. Champions, Cheaters, and Childhood Dreams: Memories of the Soap Box Derby. Akron, OH: The University of Akron Press, 2003. 1. Leon J. Pinkson, "Soap Box Derby: 200 Boys Set for Big Race On Treasure Isle Ramp Today," San Francisco Chronicle, July 30, 1939. 2. Melanie Payne, Champions, Cheaters, and Childhood Dreams: Memories of the Soap Box Derby, pp. 9-10. Page launched 22 May 2012.